Sure, a polyester psychedelic-print jumpsuit, platform boots, a fringe or fro wig, and the right dance moves can all show off your 70s style this Halloween. But why not just scream it from the rooftop at the top of your lungs and make sure there is absolutely no question in anyone’s mind? This 1970’s Gold Necklace does just that! 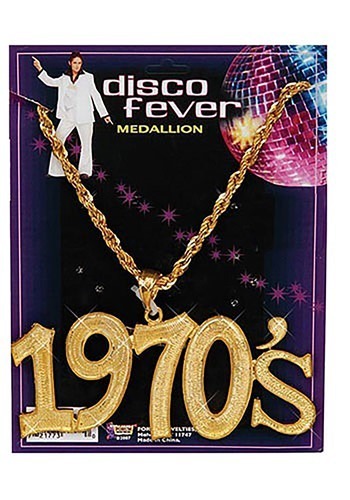 This swag makes it abundantly clear just what decadent decade you’re dressed in, and it’s undoubtedly the hottest and hippest way to catch disco fever and keep it shining all night long. The pendant necklace is actually made from cloth, but looks just like shining gold--how groovy (not to mention lightweight on the dance floor!) So don’t delay, you cool cat; you better hustle if you hope to sling on this bling and show everyone at the disco just what kind of swinging style they are dealing with.